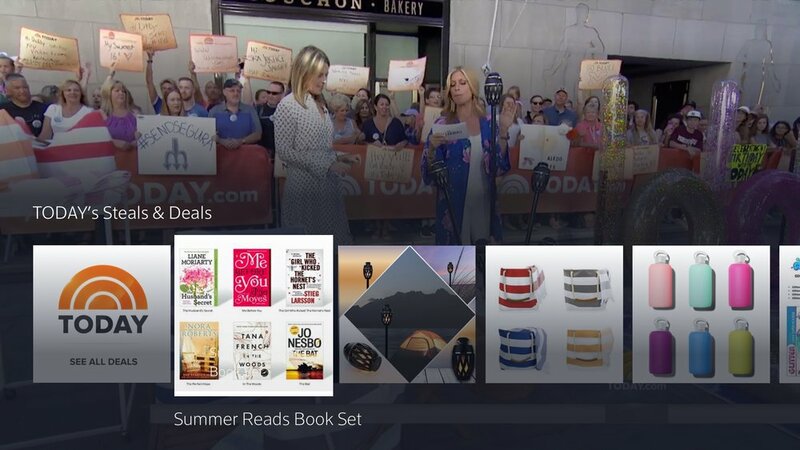 Products featured on the Steals and Deals segment of NBC’s TODAY are now available on your Xfinity X1 TV Box! The TODAY experience on X1 allows you to view product details and conveniently purchase featured items from your mobile device. · A compatible X1 TV Box (RNG150 and Pace XG1v1 devices are not supported). · Xfinity Internet service (any level). · A mobile device with text messaging capabilities. For frequently asked questions, please see the FAQs below. 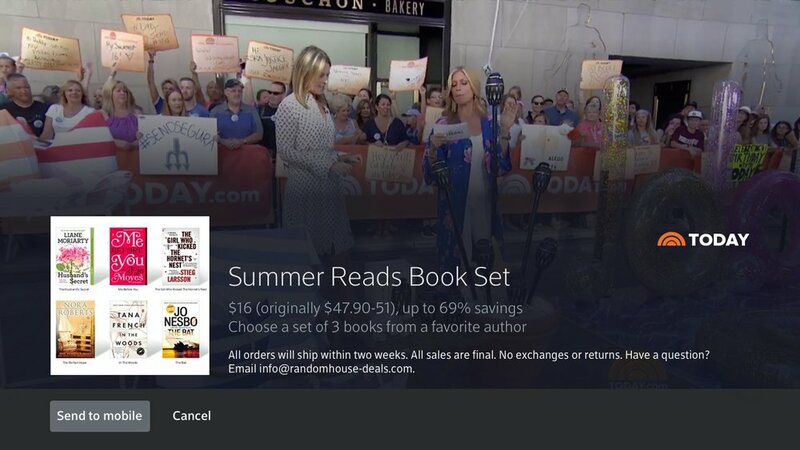 You can access TODAY's Steals and Deals while watching the Steals & Deals segment of NBC’s TODAY on July 26th, 2018. Press the Info button on your remote when the notification appears to get started. Alternatively, you can say the on air prompt that will be revealed during the show into your X1 Voice Remote to access TODAY's Steals and Deals while watching the live TODAY's Steals and Deals segment on July 26, 2018. Upon accessing the TODAY experience on X1, a gallery of featured products will be presented, along with an option to Send to Mobile. 1. Navigate to the desired product and press OK to select. 2. Select Send to mobile to enter your mobile phone number. 3. Enter your mobile phone number that you would like the product link to be sent to. Once finished, select Send text. 4. A confirmation message will display and the product details will be sent to your mobile device. 5. Press EXIT to return to the program. Note: You will be able to complete your purchase through the link sent to your mobile device. This article provides answers to frequently asked questions about the TODAY's Steals and Deals experience on Xfinity X1. 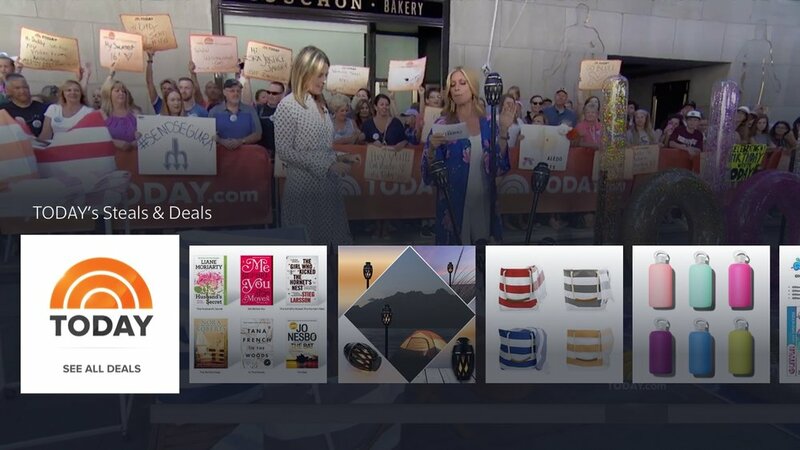 How can I access the products featured on the TODAY segment on X1? · Say the on-air prompt that will be revealed during the show into your X1 Voice Remote. How do I get back to the X1 menus and user interface once I am in the TODAY experience on X1? Press the Exit button on your remote to exit the TODAY X1 experience. You can also press the Guide or Xfinity buttons. Can I purchase the products directly through X1? You cannot purchase products directly through your X1 TV Box; however, you can enter your mobile phone number via X1 to receive an SMS text message with the product link. Use the link provided to purchase the products featured on the TODAY segment from your mobile device. See TODAY on X1 Overview above for more information on this process. How do I enter a mobile phone number to send the product link to my phone? Upon accessing the featured product from the product gallery, select Send to Mobile to have the link sent to your mobile device. You will then be prompted to enter your mobile phone number. Enter your mobile number using the numeric keypad on your X1 remote. Once finished, select Send Text. See TODAY on X1 Overview for more information on this process. Does it cost anything to use TODAY on X1? There are no additional charges for accessing the TODAY experience on X1, as the feature is included with your existing Xfinity subscription. However, please note that standard text messaging rates will apply. Will I get multiple texts and can I opt out of text messages? You will receive only one text message each time you use this service containing the product link that you requested; there is no need to opt out. Do all X1 TV Boxes support the TODAY experience on X1? Due to technical limitations with some X1 TV Boxes, the TODAY experience on X1 will not be available on RNG150 and Pace XG1v1 devices. What are the eligibility requirements for viewing the TODAY experience on X1? · A compatible X1 TV Box (RNG150 and Pace XG1v1 devices are not compatible). · A mobile device with SMS text messaging capabilities. What if I entered my phone number incorrectly? You can simply re-enter the correct phone number via the TODAY experience on X1. Once finished, select Send Text. See TODAY on X1 Overview for more information on this process. How do I learn more about the TODAY featured products? If you have specific questions about the product details, the products' websites or inventory, please check with the retailers that are making the offers for more information. Note: The exclusive deals that are available to TODAY viewers will last about 24 hours, but check the specific retailers’ sites for specific terms and conditions. Due to an overwhelming response, some of these products’ websites may experience technical difficulties. Each company is working on resolving their technical issues. Check back with TODAY for more information on other ways to purchase the products. Can I access the TODAY experience on X1 after TODAY has finished airing that day? The TODAY experience on X1 can only be accessed while TODAY is airing on that day. You can always visit the TODAY website for other product offers. Why can’t I see the TODAY experience on my X1 TV Box? If you still cannot see the TODAY experience on X1, contact us so that we can confirm whether the device is eligible and has the latest device software. Why am I receiving an error message when I try to view the products? If you receive errors within the TODAY experience on X1 that are preventing you from viewing the featured products, try exiting and relaunching the feature. If you still have trouble, try rebooting your X1 TV Box. If the problem persists, please contact Comcast customer support. You also have the option of visiting the TODAY website where you can find the featured products. ©2016 Watchwith, Inc. All rights reserved . All other products or name brands are trademarks of their respective holders.